Sunday 6th April will be the start of this years TRIUMPH RAT RUNS leaving from Fowlers Ltd at 9.30am promptly, The first destination this year will be a ride to THE NATIONAL MOTORCYCLE MUSEUM in Birmingham. Everyone is invited and it is a great way to meet new friends with a common interest. To ensure that these run smoothly for everyone’s enjoyment please be prepared for these trips. You will need to make sure you have fueled your bike before arriving and be ready to leave on time. 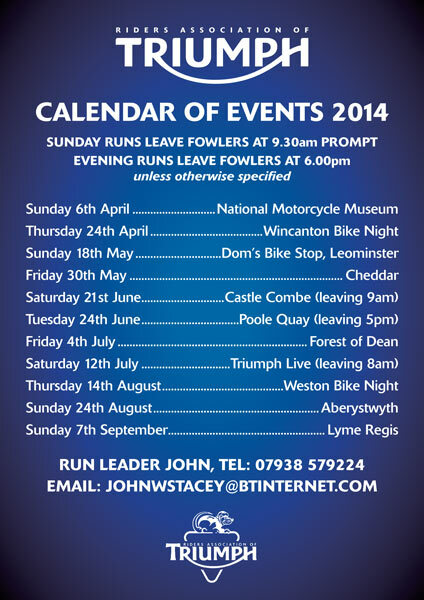 The runs will leave promptly at the times stated so please arrive at FOWLERS 10 minutes early. Please listen carefully to the brief about the route. Take care, remember the presence of a group may intimidate other road users. Why not join the fun! This entry was posted in Events and tagged 2014, Rat Run, Triumph on 03/02/2014 by Fowlers News.